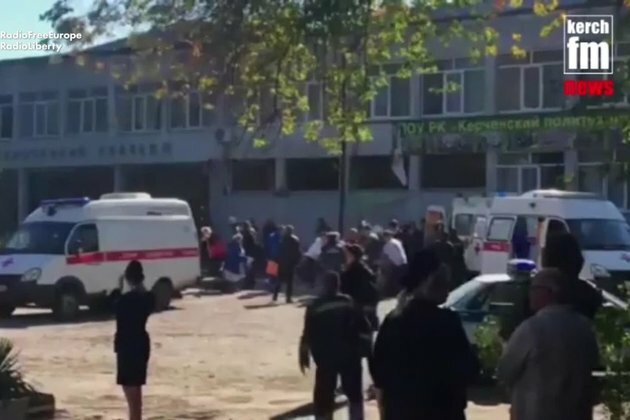 Russian authorities say an explosive device was responsible for a blast that ripped through a college in the Crimean city of Kerch, leaving 10 people feared dead and dozens injured. The blast occurred on October 17 at a polytechnic college in the city on the eastern end of the peninsula that Russia seized from Ukraine in 2014, authorities said. The woman, speaking on a mobile phone, says that shortly after she left the college for a meeting elsewhere, assailants attacked the school, throwing explosive devices and firing guns. 'They ran up to the second floor with automatic rifles -- I don't know with what -- and opened doors...and killed everyone they could find,' she said. She said students and faculty were among the dead. President Vladimir Putin's spokesman, Dmitry Peskov, said Russian authorities were considering terrorism as a possible motive. Putin voiced condolences to victims and their loved ones and ordered the authorities to evacuate badly injured victims by air to 'leading' hospitals in Moscow and other cities, Peskov said. State-run Russian news agency RIA Novosti, citing regional emergency medical officials, said that according to preliminary information, 10 people were killed. TASS, also state-run, quoted an unnamed law enforcement official as saying that about 70 people were injured and an unknown number of them had died. TASS also quoted medical workers as saying that 18 people had been hospitalized and that they were expecting more injured to be brought in.